Stay at the Hong Kong hotel city center and check out the nearby trade markets. Miss nothing on your trip. Choose Camlux Hotel for your stay and make your trip more fun. Experience the beautiful city of Hong King more closely. The city of Hong Kong is one of the largest and most significant hubs for business trades, and it is recognized worldwide. It is now the 7th largest trading industry in the world. The place attracts traders from different countries who come and invest in Hong Kong products in bulk. Hong Kong’s currency is the 13th most traded currency. With such high trade rates, it is common to see business dealers flocking in the country very frequently. Check out the best Hong Kong hotel city center for your stay. The city apart from its trade business also has some of the best attractions sites. The city is built with really impressive infrastructures which are mostly spread across the Hong Kong hotel city center. When one is in the city, he/she cannot miss out on these beautiful sights! They are definitely a visual treat to the eye. From beautiful museums to art galleries, to statues and fine restaurants, this city has everything that could possibly entertain you. The city offers some of the most luxurious hotels to stay in. With people flocking in and out of the country for business purpose or family trips, this city has beautiful hotels where you can stay on your days in Hong Kong. The 4-star hotels in Hong Kong are the best options to opt for your vacation. They provide amazing views and the best services. The hotels here are not too costly, and with all the benefits, they fit right into your budget, and you can enjoy all the services at the same time. Some of these hotels have the best outdoor views. When you are looking for a hotel, make sure to get one with a pretty outdoor view. Nothing compliments a hotel than an amazing view. The city with its skyscrapers only looks more beautiful and enchanting towards the night. The beautiful colors in the sky add up to the city’s beauty even more. When in Hong Kong, never miss out on its vivacious food culture that is influenced by a number of other cuisines. Hong Kong food is rich in flavors and is unique. The food is definitely one of the many things that will make you a fan of this country. Try all different kinds of restaurants that this city has to offer. When you are vacationing in Hong Kong, don’t miss out on these little joys. If you are a person who is here on business and will be too occupied with work, look for a hotel that also has an amazing kitchen service. Or, stay at a hotel which is nearby to all restaurants. It is always advisable to explore one’s taste buds as much as possible. One of the finest hotels you could ask for! The Camlux Hotel is one such hotel in Hong Kong city center that provides you with all these benefits. Situated near the bay, it is close to the local market. This 4-star hotel in Hong Kong has an amazing location and courteous staff. Camlux Hotel definitely stands tall to meet up all your needs. It’s a grand hotel with 185 rooms and amazing views. The service is prompt, and all your requirements are well full filled by this hotel. If you are planning a trip to Hong Kong, then Camlux Hotel can definitely be your one-stop destination. With the perfect location and environment, this hotel will be your best option for a stay in Hong Kong. The Camlux Hotel building started its life as the manufacturing home of the Camel vacuum flask brand. Established in 1940, Camel is an undisputed premium Hong Kong brand, serving both the local and international markets for the past 75 years. As part of its expansion projectile, the company acquired the land, designed, built and moved into this building in 1986 and proudly based its production here for over two and a half decades. Amongst metal pressing machines, paint spray shops, plastic injection moulding facilities and others, the building even housed an industrial scale glass furnace weighing over a hundred tons on the third floor - a true engineering feat! Bucking the trend of migrating production into mainland China, today Camel remains rooted in Hong Kong and continues to proudly fly the “Made in Hong Kong” flag. 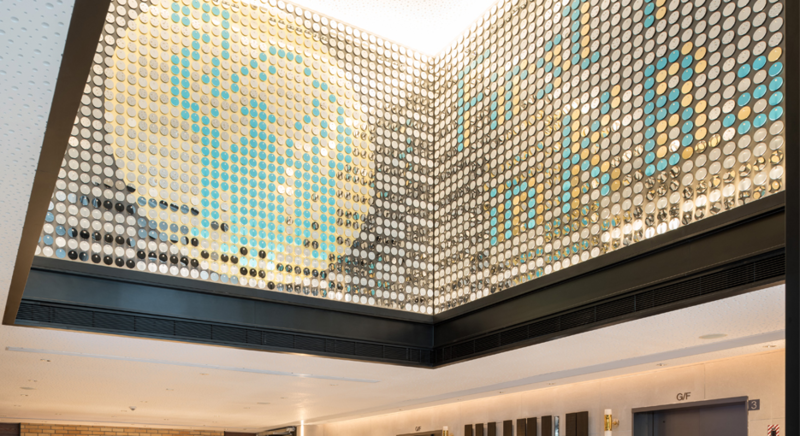 The Camlux Hotel, with its thoughtful design incorporating its glorious past life, will serve as tribute to the Camel brand in the revitalized Kowloon Bay area buzzing with commercial activities. Hong Kong is one of the most open and freest trading territories in the world and one of the world’s leading international financial centres. Learn more about the surroundings. Hong Kong offers an abundance of sightseeing and leisure activities. Discover more by clicking on any of the links below. Generally Hong Kong is very hot and humid in the summer (25~32°C / 75~90°F) and pleasant in the winter (10~20°C / 50~68°F). June to October is the rainy season, with frequent, heavy rainfall and the occasional typhoon. For more details, please visit the HK Observatory's website. Hong Kong attracts exhibitions and fairs that stand out on the world stage. Please visit: Kowloonbay International Trade and Exhibitions Centre (KITEC) or Hong Kong Convention & Exhibition Centre (HKCEC) or Asia World-Expo (AWE) or Hong Kong Tourism Board (HKTB). How to shop with extra confidence? The Quality Tourism Services (QTS) Scheme makes it easier for you to find shops which you can trust. Please visit here. For a list of holidays in Hong Kong, you can view the list of dates published by the government here. If you need an adaptor, please contact the Hotel service centre. UTC/ GMT + 8 hours. No daylight saving time.